Absinthe Kübler was first distilled in the Val de Travers back in 1863. Yves Kübler was the first distiller after his great Grandfather who was allowed to officially distill Absinthe in Switzerland in 2001. Although Absinthe was still prohibited in 2001. The product he made was an “Extrait d'’Absinthe – which is an wormwood extract, but not an Absinthe. Very tricky these Swiss guys. From March 1st. 2005 on, Absinthe is legal again in Switzerland. This new situation allows Kübler to produce a new 53% version, which he is allowed to call “Absinthe”. But that’s not all: The new formula is based on the 57% Extrait d’Absinthe but has improved dramatically. No more tails and funny aftertastes, just smoothness and a very nice herbal aroma. The taste is very long. This one can easily compete with the best clandestine La Bleue’s you ever tasted! Kübler uses wormwood and other herbs grown in the Val de Travers to ensure the product is historically accurate. The new Kübler Absinthe 53% is a true natural product without any colouring or added sugar. 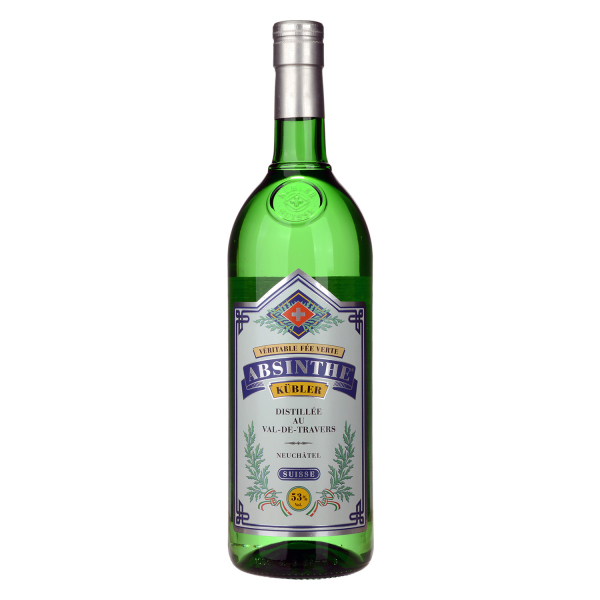 All we may say is: Voilà la véritable Fée verte – Absinthe Kübler à votre santé! Related links to "Absinthe Kübler"
Customer evaluation for "Absinthe Kübler"